Fish with rice is almost a universal meal across the world. Eastern Europe is no exception. Macedonian Fish with Rice (Македонски риба со ориз) is also known as pot rice, or baked rice. You can make it with any meat, but most commonly it’s made with chicken or fish. It’s an easy One Pot Wonder, often seasoned with Vegeta seasoning. Vegeta’s a seasoning salt created in Croatia in 1959, and is commonly used in Eastern European cooking. It was first sold in Yugoslavia, then slowly across the the Soviet Union states. Now it’s sold all over the world, including Australia. Vegeta provides an easy flavour base for this dish, along side the fish and rice. I almost feel like Vegeta is a secret ingredient used in Eastern European cooking. When someone tells you to season it, they don’t mean salt and pepper. They all use Vegeta! I almost always use Vegeta instead of salt when I’m making soup stock, it just adds better flavour. You could also add tomatoes and paprika to the Macedonian Fish with Rice for extra flavour, but that’s optional. The thing about Eastern Europeans, is that we love heat, in the form of saunas, or natural hot springs, or anything hot. Most of the Russians in Australia that I know, have visited a town in central New South Wales Australia, called Moree. And most of them did family trips to Moree as children. Moree has natural artesian hot springs baths, which are filled with Eastern Europeans, who come there for the medicinal hot waters. Seriously, so many Eastern Europeans in Moree, I think they keep the hot springs in business, and have for decades! 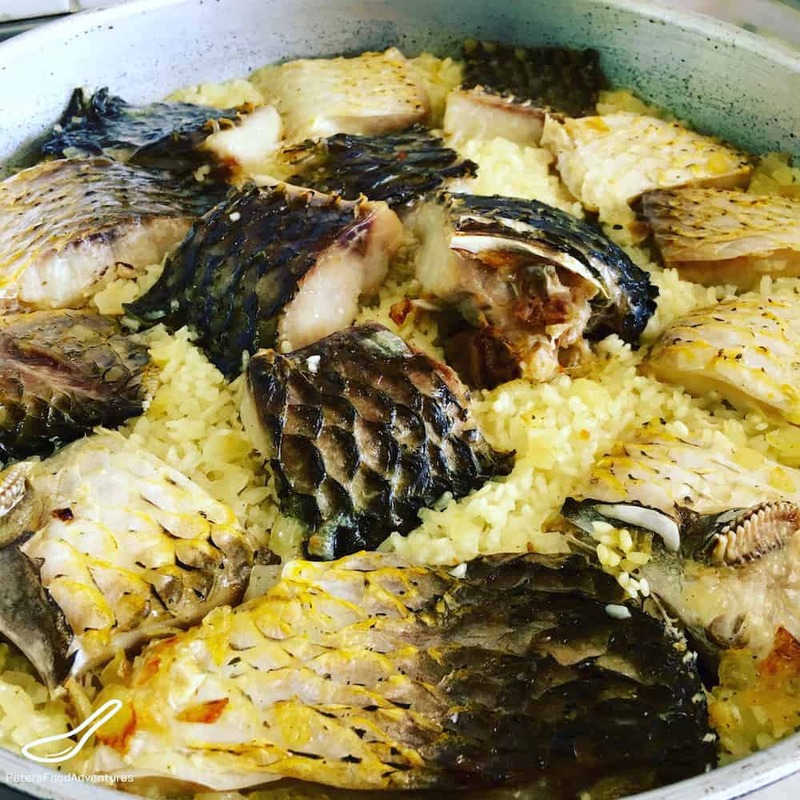 This Macedonian Fish with Rice is a recipe that I came across ages ago, from a woman name Vera, who lives near Wollongong (yes, that’s a name of city here in Australia). She was vacationing in Moree. Vera and her friends are all retired, so they don’t want to spend hours in the kitchen, they just want delicious, easy, real food, (so they can get back to the hot springs). I’m sorry I dont have more photos, but Macedonian Fish with Rice is a very rustic and easy meal to make. Carp was her fish of choice, which is a common fish in Macedonia. She told me that you can use any fish, but always use a fish with the bones still inside it, as bones provide more flavour to the meal. I must admit my heart sank a bit, as I absolutely hate bones in my fish! However, the Macedonian Fish with Rice was amazing, and the bones were easy to pull out. Macedonian Fish with Rice (Македонски риба со ориз). Rustic, real, simple. An easy meal to make, when we are short on time in our busy lives. Maybe it’s only me that feels too busy, unless anyone else has spare time to share? Thought not. Enjoy. Bon Appetit! Приятного аппетита! In a large frying pan, add oil and fry the onion and garlic and cook until translucent. Add the Vegeta and optional tomato and stir through. Cook for 3-4 minutes. Add the washed rice and fry together with the onions for a 2 minutes.Add 3 cups of water to the rice onion mixture and mix. Place the rice mixture in a baking pan/tray. Taste for flavour and saltiness and adjust Vegeta if necessary. It's best to salt the fish overnight in the fridge, or at least a few hours before using. 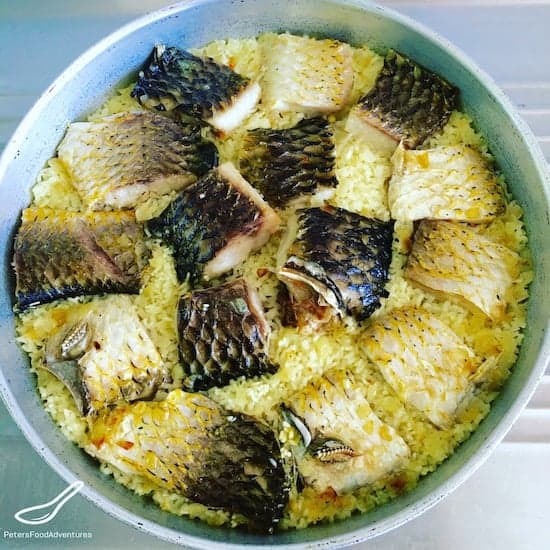 Place the fish fillet pieces on top of the rice mixture and bake for 30 minutes at 200°C/400°F or until rice and fish are cooked. *Optional - add 1 chopped tomato and 1/2 teaspoon of mild paprika for extra flavour. Looks tasty!! Yes , bones become stock add good flavour! Mmmmm… very curious about Vegeta…. . Found on Amazon JP with 4 star (out of 5) reviews! Must be good….